Bogota Colombia is a vibrant, energetic city. Its colorful artistic scene has spread to other Colombian cities like Medellin and has led to a small-city atmosphere in one of South America’s largest cities. When traveling to Bogota it’s hard to imagine that this is a city with a whopping population over 8 million people. But once you find out, it’s clear that all the things to do in Bogota would keep us hopping for the time we had to spend here. We were having such a wonderful time in the Caribbean town of Cartagena. I was starting to second guess our decision to leave and head to Colombia’s capital, Bogota. We had read so many intriguing stories about the city. And with only 48 hours to spend in the capital, we wanted to see as many things to do in Bogota as possible. So, off we went via cab to the airport. We boarded our Avianca flight from Cartagena to Bogota for the 1.5-hour flight. Flying in to Bogota is spectacular. The mountains surrounded the plane as we descended toward the city. It almost felt like we could reach out and touch the Andes. when we arrived in Bogota we were greeted by our guide for the next couple of days, the vibrant, Henry Morales of Bogota Henry Tours. Henry wasted no time introducing himself and getting to know the boys. By the time we loaded our luggage into his car, C and D were completely enamored by his outgoing personality. We knew were in good hands. The Bogota hotel that we were staying at was the Hotel Continental. The hotel’s location in the heart of Bogota meant driving right into the historic part of Bogota city, La Candelaria. For those looking for things to do in Bogota, one of the first stops is La Candelaria. 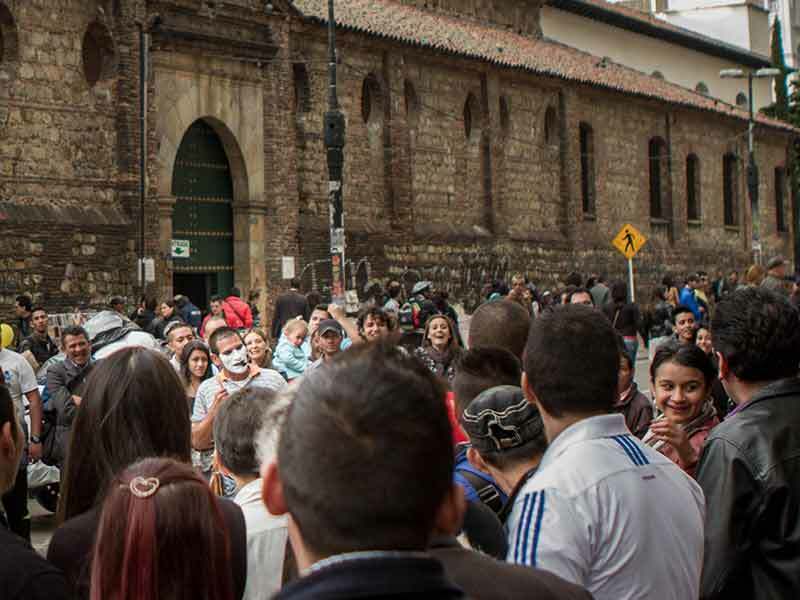 La Candelaria is one of the most well-known neighborhoods in Bogota. It is also one of the city’s most historic neighborhoods. With only 48 hours in Bogota with kids we wanted to be central, and La Candelaria, home to many museums such as the Gold Museum, churches such as St. Francis Church and many government buildings, was a perfect fit. La Candelaria is where Bogota was founded in 1538. As soon as we reached the city, we got some sandwiches from a local shop and Henry helped us check in. Once we got our things into the room, we headed back into Henry’s car to start our tour of Bogota, Colombia. 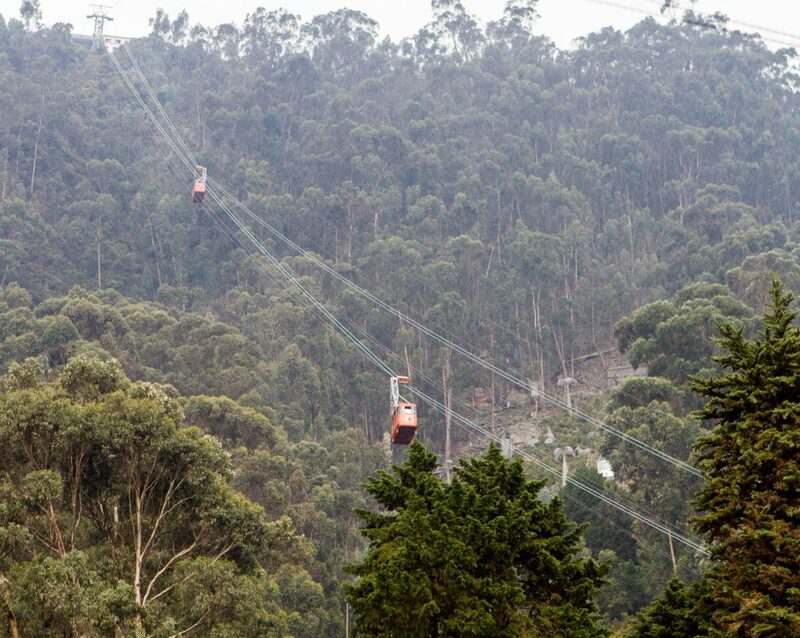 One of the top things to do in Bogota with kids is a visit to Cerro Monserrate. 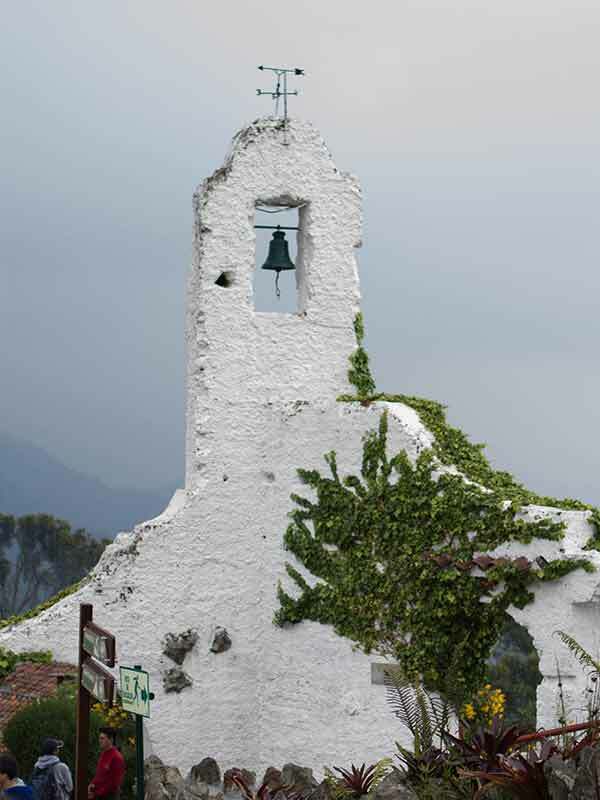 This monastery offers the most scenic views of Bogota and absolutely must be enjoyed on every visit. With nothing but clear, blue skies, We decided Cerro de Monserrate would be our first stop. The good weather would give us the best panoramic views of Bogota and the surrounding area. Henry drove the winding road that led to the ticket center for the cable car that would bring us to the top of the mountain. The narrow route can be tough for drivers that are unfamiliar with the area. 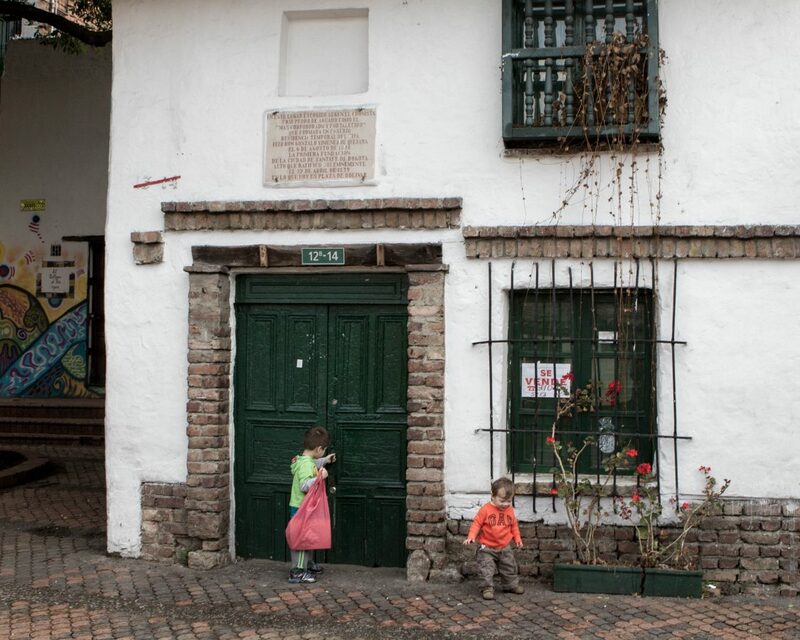 The route up to Monserrate took us along shanty’s and offered a taste of a different side of Bogota. But everywhere along the route was vibrant and filled with energy. It’s possible to purchase a ticket for the funicular to the top but it was not running while we were there. So we took the Monserrate cable car. The wait time was not long and we soon boarded and began climbing to an altitude of 3,152 m. The views of Bogota were amazing. Pro-Tip: The altitude is quite high and it is possible to get altitude sickness. Make sure to keep yourself hydrated and not to overexert yourself. For those who don’t want to spend money for the cable car or the funicular, it is possible to walk up to the top via a walking path. In fact, many Sunday worshipers who visit the Shrine of the Fallen Lord, the church on top of the mountain, reach the church via this walk. It is said that many people have experienced miracles after a pilgrimage to the church. Once we arrived at the top of the mountain it was clear that Cerro de Monserrate was incredibly special. There was no denying its place at t the top of the things to do in Bogota. Besides the church, there was also a very busy restaurant and a small market that sold souvenirs and a variety of other goods. We wandered around the top for a bit taking in the views and enjoying the gardens. Afterward, we took the walking path down which was also lined with the stations of the cross. The gardens that line the path are spectacular and colorful. It was amazing to think that there was this much life and color so high above sea level. Once back in the car, we headed back to continue our historic tour of La Candelaria. We aren’t normally fans of museums that are not interactive. We find we spend more time telling the kids “not to touch” than we do enjoying the artifacts. Also, we had already previously visited another Gold Museum in San Jose, Costa Rica. How different could this place be? However, Henry insisted that a visit to the Gold Museum is one of the top things to do in Bogota. It was a great way to gain a better understanding of Colombia’s rich Inca history. We were glad we listened to his expert advice. 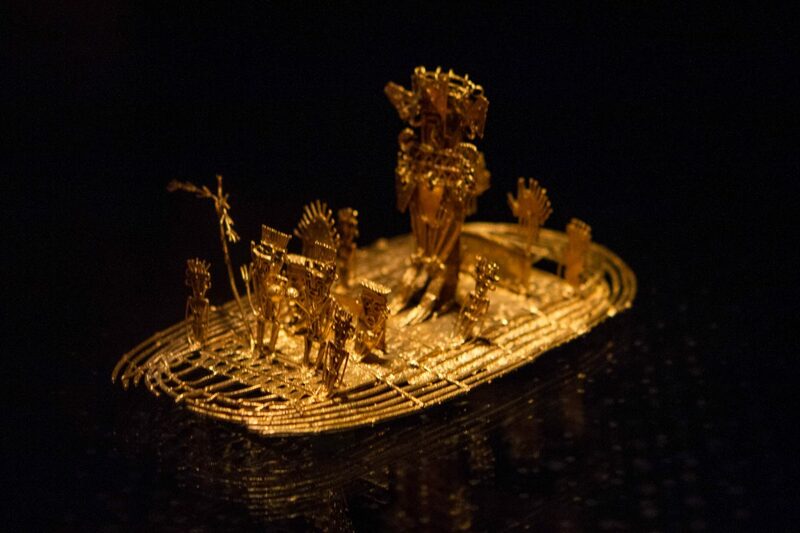 The Gold Museum has an incredible collection of pre-colonial gold pieces. It was amazing to see how intricate some of the artwork was. The museum also has other artifacts but it is definitely the gold collection that is the main attraction. C was in awe of the various gold masks and ancient tools. After the Gold Museum, we took to the streets of Bogota for some sightseeing. 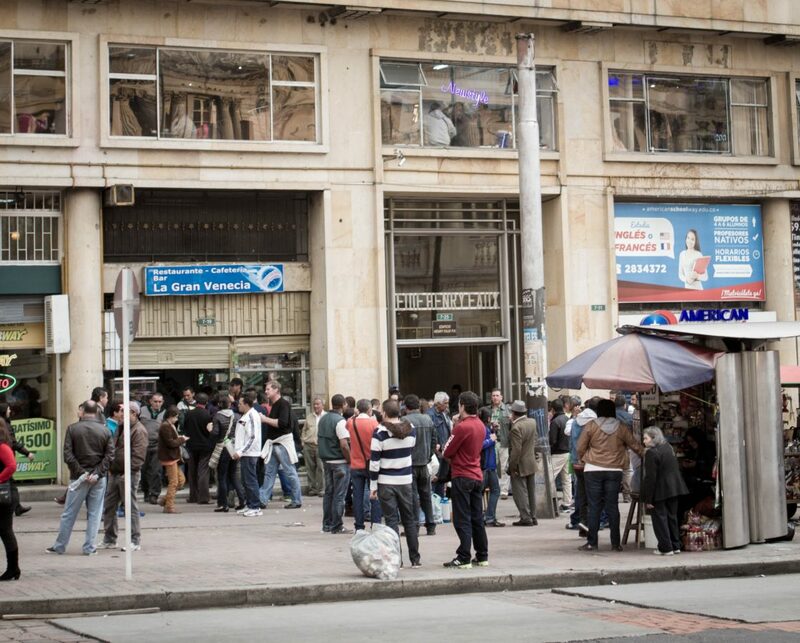 I have to admit, I was very nervous as the streets were extremely crowded and Bogota is notorious for pickpockets. We headed north of the Gold Museum to see some very old churches with interesting interiors. We visited three churches: St. Francis Church (Iglesia de San Francisco), Veracruz Church (Iglesia de la Veracruz), and La Tercera Church (Iglesia de la Tercera). La Tercera church is also known as the Church of the Stigmata or Church of the Third Order. The dome and ceiling have wonderfully wood carvings of various geometric patterns. All three had very varied architecture. Photography inside the churches was not allowed so you will just have to take my word on it! St. Francis Church is the oldest surviving church in Bogota. Built in 1557, the interior has an extraordinary 17th-century gilded main altarpiece not matched anywhere else in the city. Located beside St. Francis church, the Veracruz church stands in stark contrast with it’s harsh, barren interior. However, Veracruz church houses the remains of several national heroes who fought for Colombia’s independence and so Veracruz church is often referred to as the National Pantheon. Iglesia de la Veracruz is popularly referred to as the National Pantheon. 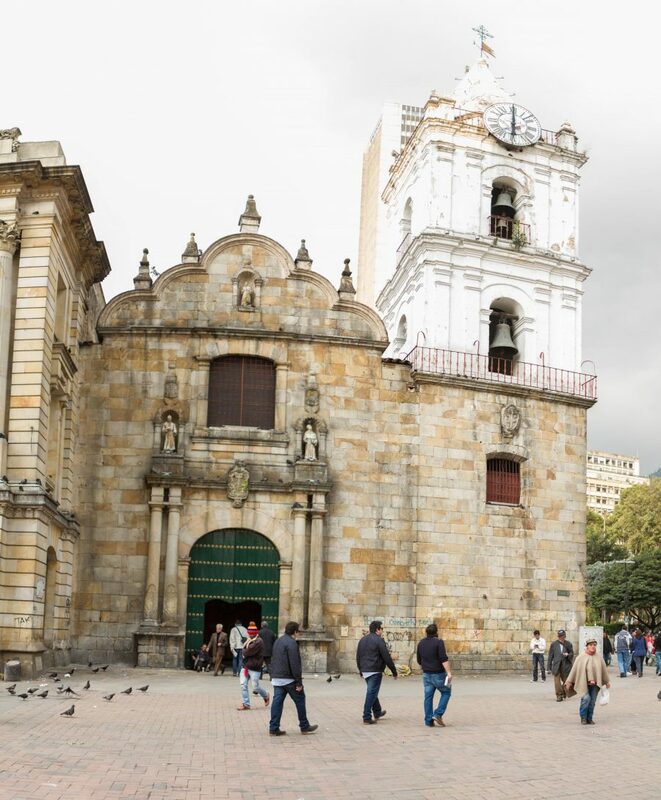 While the church may not stand out as spectacular to passers by, what makes the Church of the Veracruz one of the top things to see in Bogota isn’t it’s beauty, but it’s importance to the locals. Many of the heroes from Colombia’s fight for independence lie buried within the walls of the church. Veracruz Church was built in 1549 and was key to the growth of the Bogota market square. But it was almost completely destroyed during an earthquake in 1827, so what you see now was rebuilt shortly after. Next up on our list of things to do in Bogota was the Emerald Museum. The Bogota Emerald Museum is known to have one of the best collections of emeralds in the world. I had thought that prior reservations are required, but lucky for me, Henry was able to make arrangements and we only needed to wait a few minutes while they took our passports and ran the necessary checks. Once we entered, a guide was assigned to us and showed us around the museum. Security at the Bogota Emerald Museum was definitely tight! And for good reason, the number of loose emeralds on display was staggering (approximately 3000). There was also a wall with emeralds still in situ to let you know how they look like before they are mined. The children were even allowed to touch the emerald wall! This was definitely their favorite part of the tour. Like all tours, the guided tour ended at the gift shop but we didn’t feel any pressure to buy. After the tour, Henry drove by the area where black market emeralds are sold. This was where many people bought emeralds at reduced prices. However, buying here comes at a risk as there is no guarantee of the quality of the gems. After that, we called it a day. Normally, the day tour would have also included a visit to the Botero Museum. However, the children were losing patience and we didn’t think they could sit through another museum so we decided to end on high note. We started the second half of our 48 hours in Bogota by exploring more of the La Candelaria. First, Henry drove around and told us about Plaza de Bolivar, Bogota Cathedral, the Congress building, the Presidential Palace and city hall. He parked the car and we walked to Callejon del Embudo which is the oldest street in Bogota. This area is filled with some of the oldest buildings in Bogota such as Bogota’s oldest house, which was for sale at the time of our visit. We also saw El Chorro de Quevedo which is the site of Bogota’s founding. The kids particularly enjoyed spotting all the sculptures and graffiti the filled many of the building walls. Interestingly, tagging and graffiti are both not illegal in Colombia. In fact, graffiti has become a key part of the local art scene. 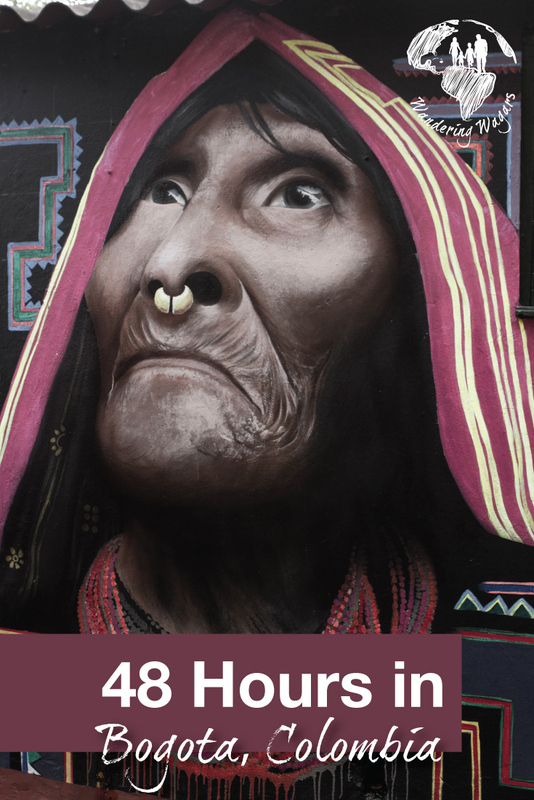 If you want to see more of the art, a Bogota Graffiti Tour is a great way to spend a day. It is on these cobblestone streets that we said goodbye to Bogota. But, before heading back to Cartagena we would be doing a day trip to Lake Guatavita. Would we find the lost treasure of El Dorado? Beautiful street art. Love the Gold Museum – that golden boat is world famous. It’s actually made by the Indians who launched the El Dorado myth. In reality, they didn’t have any gold mines, they were merely trading gold for a more precious resource in the jungle: salt. Bogota looks amazing! Just added to my must visit list! Thanks for sharing! The first thing I have to say is, 48 hours is not enough! Bogota is a wonderful city to both explore and use as a base for several day excursions! We thought the Museo del Oro was quite impressive, as was the Police Museum. Did you make it out to the Catedral del Sal? So true Chris! We would definitely go back to explore more. The Police Museum sounds very interesting. Funny you mention the Cathedral del Sal. It was actually our main reason for including Bogota as a side trip to our Cartagena vacation. Unfortunately, we were having so much fun in the old city, that by the time we got to the Catedral del Sal it had just closed (still open but no longer letting people)! Another big reason to go back! Bogota looks amazing! We are heading to Cartagena in November and hoping it starts our love affair with Colombia. Thanks for sharing! You managed to get quite a bit in across a wide range, and with little ones too! I’ve not yet been to South America, but judging by your post, I sure ought to! Wow you packed a lot into 48 hours! Hopefully I’ll get to visit one day and follow your recommendations – I’d love to take a street art tour. WE MISSED BOGATA ON OUR LAST TRIP TO COLOMBIA…DEF NEXT TIME! This sounds like a great 48 hours. Will definitely bookmark this for our trip next year. What a really fascinating place to visit – somewhere I’d never have thought of. I love cable cars, so that would definitely have appealed, but am especially taken by the gold museum. Sounds a real gem. Wow, no wonder the emerald museum was their favourite part of the trip….. 3000 stones and wall of them you can touch!?! Sounds like so much fun!! Looks like a lovely place to visit. I would love to see the Shrine of the Fallen Lord. I would also be interested in the Gold and Emerald museums. My Dad gave my Mom a gorgeous emerald for their 25th anniversary years ago. Henry sounds like an absolutely wonderful tour guide! I, too, would have likely questioned my decision to leave Cartagena and visit Bogota, as I’ve always heard wonderful things about Cartagena and mention of Bogota’s notorious pickpockets. There seem to be tons of things to do in Bogota though. Montserrate sounds like a definite must, as does exploring Candelaira. I can’t believe the kids were allowed to touch the emeralds in the museum. I can definitely see why that would be their favorite part! I’ve always wanted to visit Colombia (blame my childhood Shakira obsession!) Bogota sounds really interesting. I especially love the street art and graffiti! I love the cross between jungle and history that I get from this post, and probably something that you felt in Bogota. I’d love to go one day! I love that they had to check your passports to go into the emerald museum… because you guys do look like international jewel thieves. I can’t believe you were able to do so much within 48 hours and with kids! I’ve never read a post about Bogota and it was very interesting because you had a tour guide with you the entire time. In your opinion, is that something that is a must when visiting Bogota? Hey Candy! Just to chime in, I don’t think a tour guide is necessary but I a driver is a must! We had one take us to all the sites and would wait for us outside all the restaurants. We felt very safe under Alvaro’s care and made everything so convenient. I was born and raised in Venezuela yet I never visited Colombia. I now have friends that live there and seeing all the great things you can see and do I should make it a priority and go visit them and see some of the great things you got to see. I especially want to do the cable car ride for the views and the museums sound amazing. Thanks for sharing. Happy Roving!!! Great detailed information about this beautiful city. I’ve spent time in Quito, Ecuador and remember the initial challenges that I had with the altitude. I love that you guys are traveling with your children. 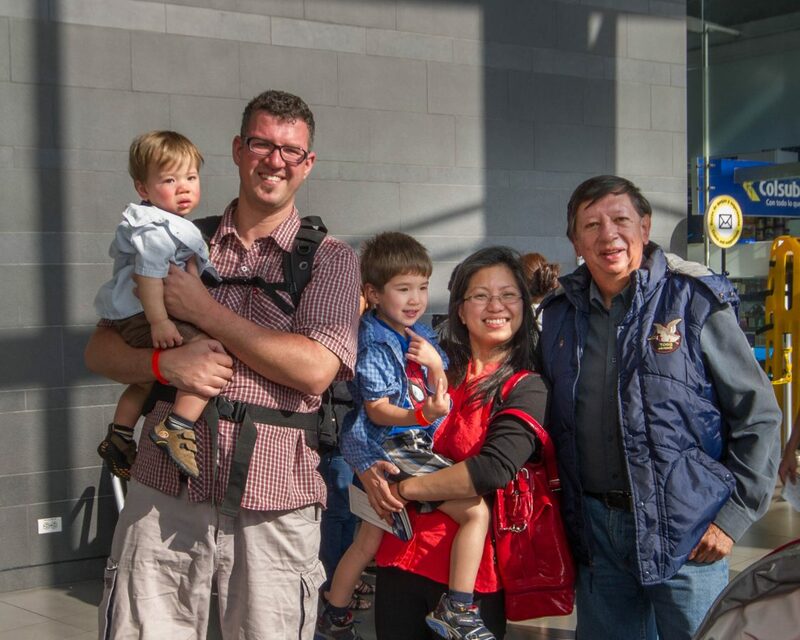 My husband and I began traveling with our son when he was one year old. Now he’s 26 and still has a taste for travel. Our latest family adventure was climbing the Great Wall of China together. Thank you for sharing that Adrienne! We certainly hope that our children will be inspired by their travels that it will open them up to the world. It’s incredible to hear that your travels have inspired your son! I can’t wait to go to Bogota someday! You guys look like you had an amazing time! It’s so interesting to read about your travels with children in tow. It can really be a game changer, but it certainly doesn’t seem to slow you down! I really want to know more about the emerald museum. I think I would love it. I have never been to Colombia, but have been so intrigued. I love that you shared things to do there, because it’ll make it much easier to plan. The cable car ride up for panoramic views looks like fun!! And I think I would enjoy the gold museum. 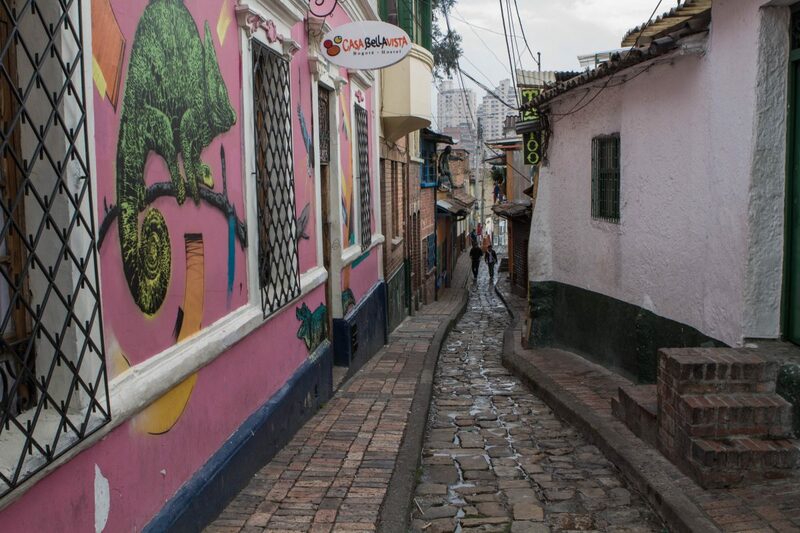 La Candelaria looks so interesting too – I love the graffiti walls and cobblestone roads. What an incredible city. The street art shots are amazing. Would love to visit an Emerald museum. How cool. Have not made it to Colombia yet! Need to head back to South America soon. I’m impressed how much you accomplished in 48 hours and with two kids. Very nice! This place looks like it has so much culture! Great photos and descriptions! I haven’t been to Columbia yet! This seems like a solid itinerary because I love museums, churches and culture. I’ll definitely be saving this for the future. Thanks for sharing. Incredible that you were able to visit a church built in 1557! It’s hard for me to imagine. Also, I really love the street art that you discovered. What a whirlwind of a trip! 48 hours is so short, but nonetheless wish Bogota was closer so we can spend a weekend there! I never knew so many things were in Bogota and would love to go back asap to S.A. for it! Your post brought me back to my visit four years ago. It was the first stop on my honeymoon tour of South America. One of my friends is Colombian, so we wanted to enrich ourselves in his culture. It wasn’t previously on our radar (for obvious reasons of past drug trade), but we were blown away with the beauty of Bogota. We wished we stayed longer than our 3 days! Bogota sounds like a really interesting, vibrant city. The emerald museum sounds absolutely fascinating! Colombia, the name itself evokes imagery of a different kind. All the places that you have covered and described in the post live up to the expectations. I am particularly impressed by the museums and their collections. I can take a hike but I’d rather take the cable car, just because I want to experience it even when I’m scared of heights. The Gold Museum looks interesting. I love going to museums so if ever I go to Bogota I will include that in the itinerary. All in all, it looks Bogota has so much to offer. Wow this looks like an amazing time and an amazing city! I’ve always heard amazing things despite previous negative connotations – definitely on the bucket list for when we finally get to South America! Oh wow! The historic city of Bogota! I’ve read about the gold museum and the churches before but ha e only seen the cable car now. I definitely would be interested in that! I love the views from a cable car. Good to see you had a blast even if it’s just 48 hrs in the city. as a tour guide myself, Henry did his job really well and how to do the consequence by the way you mentioned it here. Bravo to the one great man! I salute his job as well. Bogota is one of the places I noted on my list when I will be visiting Colombia soon.And I do hope to meet Henry and do all of these, if not, then, by this blog, I have a good way to guide myself. I had no clue what a funicular was until last month in Istanbul 😉 Now I know. I usually walk but do the ride bit to avoid the hills. Fabulous scenery. Hearing of those blue, blue skies reminds me of similar skies in a somewhat neighboring country in Peru. Those cloudless days in Cusco were magic! Did you like the tour? I’m going to Bogotá next month with my kids. Absolutely! We loved it. Bogota is a really cool city. I wish we had more time to spend there.